Smart technology arrives at your doorstep with new front door security systems from August Home. 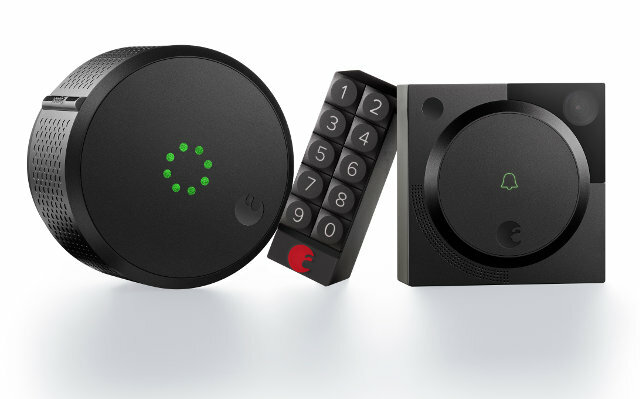 While the original August Smart Lock let you lock and unlock your door via your smartphone, the new Doorbell Cam and Smart Keypad let you see who's there and create custom lock codes for friends, family and service people. The $199 Doorbell Cam sends an alert straight to your phone whenever someone rings the doorbell. The built-in video camera lets you see who’s there in 1280 x 960 high-definition resolution, streamed to the August Smart Lock app on your phone. Since it’s a one-way camera, visitors can't see you; you maintain complete privacy. The Doorbell Cam's built-in speaker and microphone let you conveniently interact with guests through your smartphone wherever you are. To let them in, a single tap in the Smart Lock app unbolts the door, even if you’re in the bedroom upstairs or at the back of the house. You can remotely manage your door even when you’re away from home, since the Doorbell cam services as a Bluetooth-Wi-Fi bridge to relay your "open" command. The Doorbell Cam replaces your standard wired doorbell. It needs a wired power supply, so it won’t work if you're replacing a wireless doorbell. The Doorbell Cam's features make it a natural for increasing front-door security. Guests don't have to ring the bell to activate the system. The Doorbell Cam detects motion, so it alerts you whenever someone is at the door. It snaps occasional photos throughout the day so you get an idea of the activity outside your door. Today, you can view activity on-demand outside your door, and within the next 90 days, an automatic software update will enable motion detection alerts and recording of interactions at the door. For a Bluetooth-driven option for unlocking your door without keys or your smartphone, the August Smart Keypad ($79.99) provides a handy solution. Simply stick or screw it onto your door, then type in your security code to unlock the door or press just one key to lock it. A digital system can be quite a saving grace whenever you forget your phone or keys or come home after your phone battery's dead. Assign passcodes to trusted people so they can open the door themselves. Smart Lock logs all the activity, so you’ll always know who's come in through your door. To learn more about August Home’s smart accessories, visit August.com, or order the Doorbell Cam or Smart Keypad from Amazon. Home security and door locks are getting smarter all the time. Explore five of the best smart locks for your home. Updated on 3/29/2016 with corrected information on Doorbell Cam. Yeah, I also like this august smart new doorbell because of some new extra device included. It’s always secured our house. Finally, it will a perfect home doorbell.